Anyway, Matigol Falls in Arakan, North Cotabato is just less than two hours away from Davao City. We arrived in Arakan at around 5AM and started the trek right away. From the jump off area, there will be a 30-45 minutes trek to the registration. All fees will be paid in the registration area. From there, an hour of mesmerizing mountain climbing awaits. Why? These photos will tell you why! After few minutes of break, we started to climb up the trail of the falls. Here’s when the climax started. The trail is too steep, just like any other mountain when you are near the summit. However, it’s all worth it! Forget about getting sunburn and getting tired. Just enjoy the moment, feel the cold fresh water and dive into it. Being on top of the mountain, away from the city life, brings so much calmness within. To see our entire experience, check out my vlog about Matigol Falls. It will give you much more idea of how the experience will be. Enjoy! After Matigol Falls, we went straight to Bemwa Farm to get some refreshments. You can take a lot pictures in the farm as they offer different crops such as Strawberries!!! There’s a minimal entrance fee to the farm. We also had some merienda (in my case, lunch haha) in Seagull Mountain Resort. Make sure to have your cameras ready! You’ll be transported to Baguio while in Mindanao! LOL. Seriously, there are a lot of instagram-worthy spots in that area. You gotta try also their Hot Tsokalate and Suman. You must! If you are looking for a place to stay in Davao, you may want to try Red Planet Davao for a discounted price! Just click the photo below. For Part 1 of the blog, click here..
After our lunch and a little rest in the resort, we headed to the most awaited part – Bucas Grande and the rest of Sohoton Cove. Unfortunately, a bad news reported to us that jellyfishes weren’t visible at the moment. According to locals, summer is the best season to visit Bucas Grande because jellyfishes are abundant in the area. Anyway, we still go our way to the cove that means “Grand Opening”. Registration Area to Bucas Grande. We stopped by the registration area because the big boats cannot pass through the gate of the cove. It is only accessible during low tide and via an 8-man boat (including the guide and captain), therefore it’s really a must to go out of the cove when the level of water is getting high since there’s no way out than the ‘gate’. At maliit lang ang opening kaya you have to watch your head out from stalactites. The gate to Bucas Grande. Passing through the grand opening (translation of Bucas Grande) is like having a grand entrance – A little suspense from the dark until islets after islets shine through and a sea of green dominates my sight. There are only three things to visit in the cove. First, the small Hagukan Cave. Travelers need to swim going inside to see it’s beauty. I advise to make sure you have lifevest eventhough you know how to swim. Malalim kasi ang tubig at nakakapagod if there’s no lifevest. You will not enjoy the view. Why? It’s weird why the water seems like glowing. They say it could be the jellyfishes but I haven’t seen even one. Though maybe it’s the light from the sun that diffracted when it passed through the water and spread out underneath the cave – like something that’s glowing in the dark. Third is everything you see in Bucas Grande. It’s like entering a colony of something. When I was there, I imagined myself in the movie ‘Anaconda’ (less Anaconda, of course HAHA) – the time when they’re traversing the Amazon River peacefully with only the sound of nature and the purr of the boat’s engine – like there’s nobody there but us. All that voices out to my mouth is the word ‘wow’. Wow because the cove is like walled by different islets – like a colony safeguarded of indestructible walls to protect from enemy. As I said, there’s no other way out but the small ‘gate’ that closes during high tides. Wow because no man can create such, yet it’s like planned by someone with great powers. Wow because the cove supports wide array of biodiversity where animals freely live in the wild. The endangered Philippine Eagles seem like watching us from afar, like a soldier ready to attack when triggered. Wow because the jellyfishes are friendly enough to play with its visitors without their defensive mechanisms. Wow because the panoramic view of the entire cove is stunning enough to let your eyes simply enjoy the sight. Wow because that is all a speechless mind can utter from amazement and surprise. The protected area of Bucas Grande is another evidence of why the Philippines is gifted of beauty of nature and biodiversity. Yet, the protected area is like begging for something that might endanger it from us. The only photo that will break your heart..
One of the first things I’ve noticed when we arrived at Claver was the effect of quarries in this part of Surigao. A lot of industrial ships, almost all of it were aged and weather-beaten, were docked and roaming around the place. The ships must be very busy of something aggressive happening nearby. At first, I thought they only concentrated to a specific area far from where we’re going. However, in the middle of the sea, I’ve realized how great these quarries have already impacted Surigao. Then, it caught me thinking the possible effect of these activities to the place that got me wowed. Sohoton is in danger, I believe. . While it seems like a peaceful place, focusing your eyes on the background reveals the effect of mining activities in Surigao. Please note that the island in the background is around 40 minutes away by boat. Thus, to see the deforested mountain kilometers away from where I took the photo means that the impact has gone worst. Unfortunately, it’s not the only area where deforestation exists. This video below proves it very well although it hasn’t captured the looooong stretch of it. (Credits to the owner of the video). The video from Youtube is the same place we passed by going back to Davao City. The long stretch of the effect of mining activity in this part of Surigao seems like we weren’t even gone by a paradise like Sohoton. It’s weary, distressing and heartbreaking. The view at the top will show you hectares of no trees and grasses but trucks and cancerous mountain. A very heart-pumping and very grateful experience in Sohoton and Bucas Grande was translated to grief and sorrow. The ‘desert’ in Surigao is warning us of the greater effect it could cause the gift of nature we have. Although there have been mining laws signed by different authorities to protect our environment, mining such as this should be investigated by the government to ensure compliance to laws. Gifts must be treasured than taken for granted. My only prayer after more than an hour of traversing the ‘hell to Sohoton’ is for us to have more time to correct the mistake we have done to this paradise. It will never too late. My hopes are up that nothing worst will happen and will ever reach the paradise of Sohoton. Okay, so before I go straight to what I meant by the title, Sohoton Cove is seriously one of the best I’ve seen. Never in my backpacking life when I saw eagles freely living in the wild nor people can ‘mingle’ with jellyfish (though I wasn’t able to do this) nor seen as much islets as possibly exist in one place. As I told myself, the cove is like Chocolate Hills of Bohol submerged in the deep of the edge of the pacific waters. Whenever we pass by the middle of two islets is like entering ‘a gate of heaven on earth’; and simultaneously a louder hums of birds like drum rolls for festive. Nature has never failed to amaze me and always prove that earth is a paradise only taken for granted. We left Davao City on Saturday night at past 10. We spent the night trying to catch sleep while bending over our seats. For a person like me who cannot easily rest my body while on the road, the 9-hour travel will be a big challenge knowing that after arrival in Claver, Surigao del Norte, we went straight to Barangay Socorro where the whole day Sohoton adventure will start. But to compensate the sleeplessness, nature has dosed me with a lot of adrenaline. From Claver, we crossed by boat for around 30 minutes to our first stop – Crystal and Bolitas Cave. Stalactites and stalagmites will always be a wonder to me. It’s amusing and at the same time eerie and strange. The Crystal Cave is not huge, though the jellyfish-shaped stalagmite is enough to believe that Sohoton is truly the house of friendly jellyfishes welcoming the people. We headed next to Tiktikan and Tiktikan Lagoon. Honestly, it’s not only the islands/destinations that need attention because the sceneries going there is already a bonus. I mean, imagine navigating in the Amazon River just like we see in movies. It’s like that! The lagoon, although has a little scenic view, is I guess polluted. Parang mabaho yung tubig. It’s just okay for pictures cos I think no one will ever want to dive on it. On the other side facing the sea, there’s a diving board installed about 20 feet high. It’s for adventure seekers who knows how to swim haha. I did want to jump, however, they don’t allow diving with a vest. It would be fun sana because the clear water is enticing. Plus, the view on top makes me wanna scream ‘I am the greatest!’ LOL. After 45 minutes, we went to Marka-a Island where first time I’ve ever seen a clear royal blue water from afar (Most of time kasi it’s blue green because of the white sand and the light of the sun). It’s a small virgin island waiting to be discovered. The pristine water seduces me from taking its photos to plunging into it. And you cannot say no to its invitation. Apologies if I wasn’t able to capture the clear royal blue from afar. I was instantly mesmerized and… stunned. 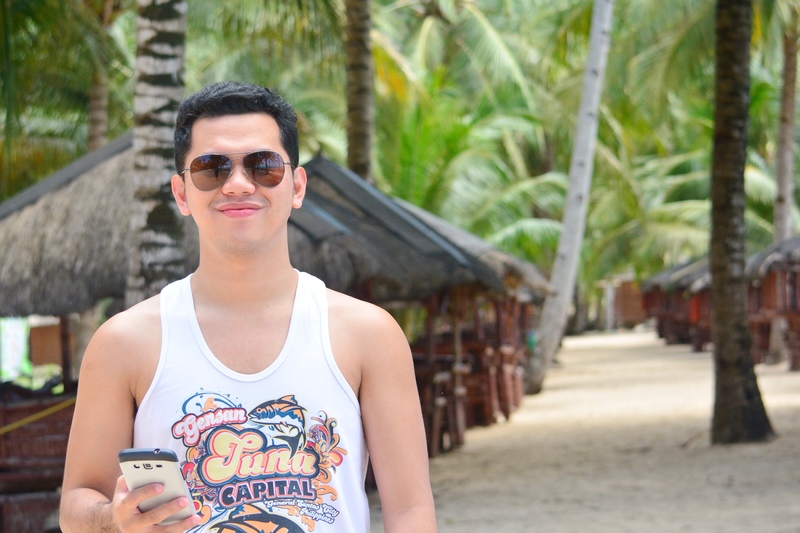 Indeed, just in time for lunch, we checked in at Kanlunes Beach Resort with a very welcoming scenic – coconut trees, long shore, group of islets, ruined boat, white sand, etc – the place worth it of the money we spent to witness the beauty of it. The food (lunch, dinner and breakfast) is decent enough to be shared among the 25 of us. The nippa room air-conditioned at night with toilet inside. There’s karaoke for the singers and wannabe. Wide space to stroll at night and for morning walks and of course, fresh air to cleanse the body from the city life. That is the half of our day. No sleep, restless body, yet eager to explore the paradise we’ve been hearing from people who have seen it. I am amazed and wowed despite yesterday’s hassle – Only to find out that later that day is the highlight of it all. Yet, frustrating to realize how endangered the cove is from the goings-on nearby. For Part 2, click here..